Hey friends...still on the coloring kick and this little number is going into the Sketch challenge at Operation Write Home and the Saturated Canary Challenge. Digi is by Saturated Canary (how adorable that she has a sack full of Copics). Laid down the streak of paint in the wrong spot, so I had to turn the sketch. Hope you are having a nice crafty day. Very nice coloring. She is adorable! I love how your stamp goes from one layer to the next. Very nice. Great job! I am still trying to work up the courage to color a SC digi! the stacked image worked well! tfs!!! Great coloring job, love how you have it going across the different layers! 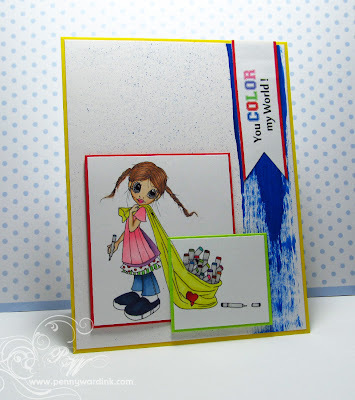 Adorable card - love the streak of paint!